Mounting LOPS or Low Oil Pressure Switch is an important safety major all maintenance engineers should take to prevent the breakdown. It is very important that the air compressor should run in good working condition to deliver the best result. LOPS will take care of this important engineering utility. You cannot keep one operator for a full time near to compressor & keep watching the performance. Hence it is necessary to provide some safety switches in control panel. These safety devices will work in abnormal condition & stop electric motor and further prevent any breakdown in Air Compressor. Many safety switches are used to avoid any accident to an air compressor. Out of that, the most important safety switch is “Low oil pressure switch” in short LOPS. As the name indicates; this switch will operate in condition when the oil pressure in the crankcase is lower than set limit & stops the compressor. INDFOS make IPS-70 switch is commonly used & the function of this switch is to monitor the oil pressure in the crankcase of an air compressor. This switch is connected to the oil pressure sensing line coming from the crankcase to the oil pressure gauge, through Tee connection. The main spring can be set to balance different pressure on the bellows. When the pressure increases, the bellow is affected. So that the main spindle is moved upwards until the spring pressure balances the bellow pressure. 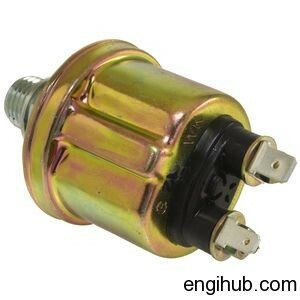 The spindle has guiding knob and differential adjusting nut which jointly transmit the spindle movement to the switch. The differential pressure has to be set at zero (Indicator scale at extreme left, facing to LOPS). And the main scale is set to required pressure. (Minimum oil pressure required by the compressor. i.e. 14 PSIG for reciprocating air compressor & 35 PSIG for a rotary air compressor). The pressure on the main scale can be set by rotating the knob given at top of the switch. Connect an Ohmmeter across normal open contact of the switch to observe the switch operation. Start the compressor and watch the oil pressure at which contacts close, then stop the compressor to see what oil pressure contacts open. By adjusting the knob further fine adjustment can be done to the exact pressure required. To confirm the setting by starting & stopping the compressor. Since the switch remains open during starting, a normal close contact of the timer is connected to the normally open contact of LOPS. The timer is set for 60 sec. As the compressor starts, a timer starts its timing cycle and the compressor oil pressure also start building up to 60 sec. timer contacts will become open. Due to developed oil pressure in sensing line, LOPS contacts closes & continued the healthy running condition of an air compressor. In case the oil pressure does not build due to any reason, this contact remains open and the compressor will trip in 60 sec. time span. An indicator lamp on Solid State Annunciation or any other indication device will flash & hooter starts blowing, rush to compressor immediately & rectify the problem.